Russian Journal of Cardiology has been issued since 1996. The language of this publication is Russian, with tables of contents and abstracts of all articles presented in English as well. Editor-in-Chief: Prof. Eugene V.Shlyakhto, President of the Russian Society of Cardiology. The aim of the journal is both scientific and practical, also with referring to organizing matters of the Society. The best of all cardiologic research in Russia is submitted to the Journal. Moreover, it contains useful tips and clinical examples for practicing cardiologists. Journal is peer-reviewed, with multi-stage editing. The editorial board is presented by the leading cardiologists from different cities of Russia. 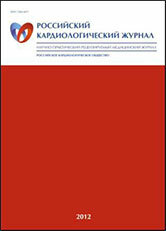 The journal is recommended by the Russian Highest Certifying Commission for publication of the results of degree theses. It is included into Scientific Electronic Library (www.elibrary.ru), Russian Index of Scientific Citation, Science Citation Index Expanded (SciSearch®); Journal Citation Reports/ Science Edition. It is authorized by the Russian Society of Cardiology for publication of Russian and ESC Guidelines on cardiovascular disease diagnosis and therapy. It is authorized by RSC for publication of Russian and ESC Guidelines on cardiovascular disease diagnosis and therapy. ISSN 1560-4071, circulation - 7.000 copies, periodicity - 12 issues per year. It is published by “Silicea-Poligraf”, www.roscardio.ru (for more information, please e-mail to info@scardio.ru).